With Steve Chong Finds Out That Suicide Is a Bad Idea, director Charlie LaVoy reveals himself to be a promising young talent, even if his film falters from a cliché, underdeveloped script and a wet-behind-the-ears leading man. Stanley Wong plays the college-age Steve Chong, a mopey, self-described failure who, in order to overcome his depression for a weekend, calls upon his college buddies to partake in a college-style lake house weekend, despite the fact that they are all suffering from variations on a wincingly post-college malaise. Clearly an attempt to capture the inevitable depression that creeps into every direction-less college graduate in his or her (in this case, His with a capital H – more on that later) first foray into the “real world”, …Suicide is a Bad Idea places limitations on its own narrow scope by failing to ever address the world that exists beyond Steve’s psyche or the Hangover-style shenanigans of four dudes at a lake house. And Four Dudes at a Lake House could have easily served as an alternate title. 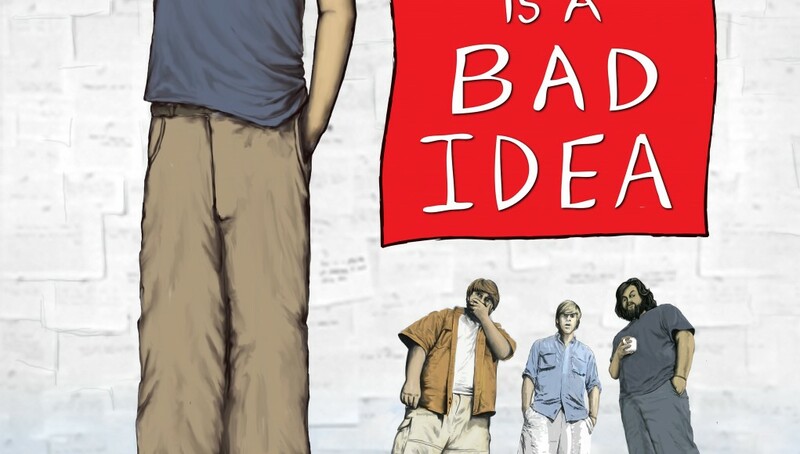 Working on an obvious shoestring budget, the vast majority of the film focuses on the bonding that takes place between Steve and his burly, bearded buds, John, Chris, and Tom, as they inhabit a lake house owned by Steve’s parents for the weekend. This backdrop wouldn’t be all that problematic, save for the fact that the script never advances the narrative quickly enough, and moments like Steve’s friends forming a search party to find him, or John attempting to confront Steve about his recent bout with sadness, feel clunky, undeveloped, and occasionally just plain unnecessary. In a film this low-budget, a brisk, tightly-constructed script could allow the viewer to forgive and forget shortcomings in aesthetic qualities like set design or costume, but instead this film’s slowly-paced narrative forces us to dwell on them. Luckily LaVoy’s camera work is often compelling enough to wring some degree of profundity out of this story despite the misgivings of the script. Exterior shots of the lake house setting help set the tone of certain scenes, and LaVoy possesses a natural talent for visual storytelling, with nearly every cue, cut, mise-en-scene, and expert use of indie music enhancing his narrative rather than confusing or detracting from it. Another high point of the film is the acting by the supporting cast of Joe Sokmen, Owen Hornstein III, and Tyler Russell, who make the most of the script’s low-brow college humor with some definitive on-screen chemistry. When they locate Steve’s pathetic attempts at suicide letters on a computer, they transform an otherwise crass scene into something legitimately funny. Unfortunately the same can’t be said for Stanley Wong, who simply lacks enough thespian skill or star appeal to carry a feature-length film in the title role. The script wisely shifts perspective midway through, allowing his character to fade into the background while his three wily companions invade the foreground to wrestle with both Steve’s and their own various conflicts. Sadly, Jenn Foreman as Alice, whose screen presence conveys genuine emotion and charm, shoulders the unenviable task of adding substance to the lead female role in a film whose mishandling of women (yes, pun intended) is at best shamelessly juvenile, and at worst downright misogynist. Alice’s closing salvo somehow manages to paint women as uncaring, fickle, pleasure-driven, and prudish, all at the same time. Throughout the rest of the film, her and the other female characters function as little more than one night stands or romanticized objects of male yearning. While the character of Tom embodies just as many shallow, reprehensible traits as Alice, his character is rounded out by a genuine brotherly love for Steve and the noble intentions that go along with it. This luxury is never afforded to the character of Alice, which makes the fact that she is the only female with more than two minutes of screen time extremely regrettable. 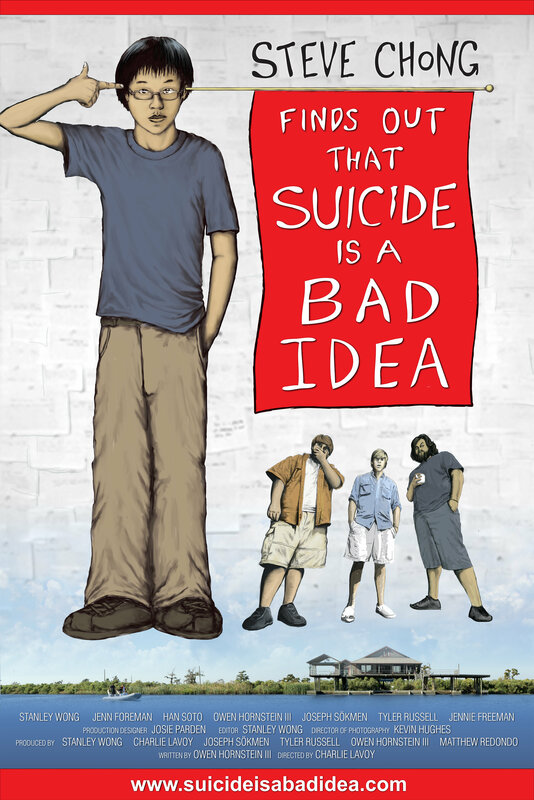 With a host directorial flourishes and some great young talent represented in its supporting cast, Steve Chong Finds Out That Suicide Is a Bad Idea serves as a fine showcase for a few eager, up-and-coming actors and filmmakers. Harboring any expectations for the film beyond that, however, is simply a bad idea.